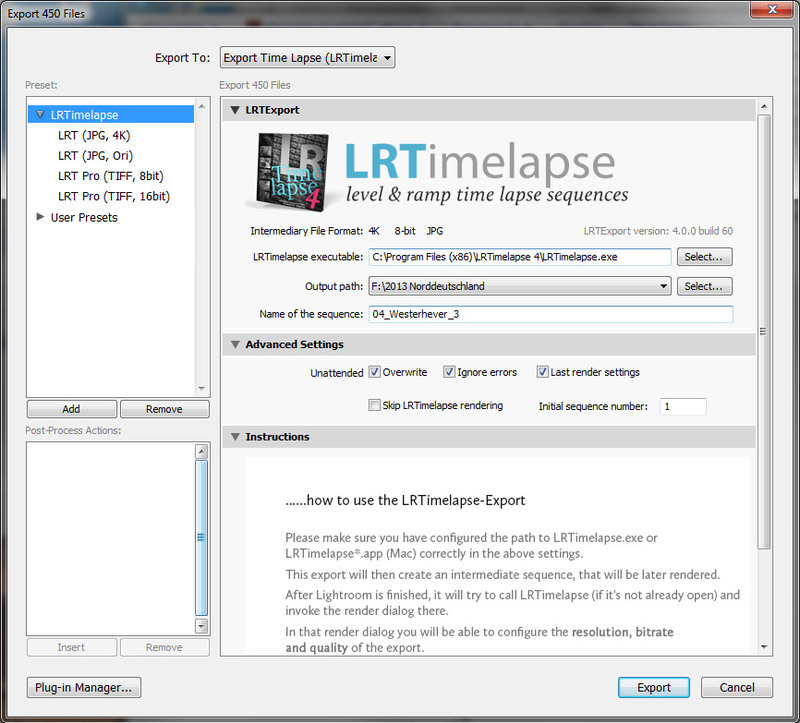 LRTimelapse 4 – This is new! 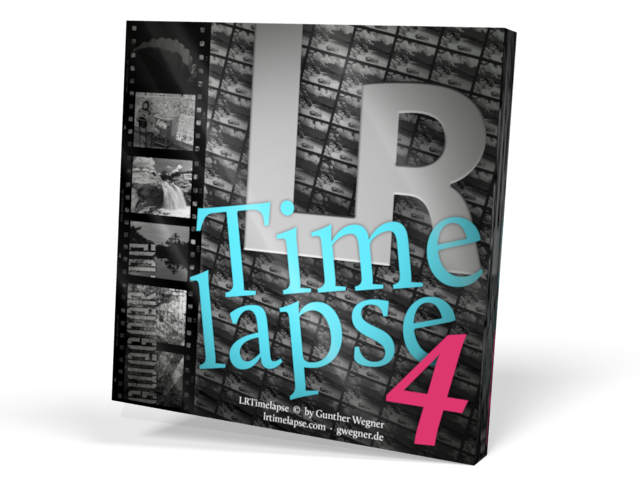 LRTimelapse 4 is the new version of the popular tool for time lapse editing and will help you bring your time lapse work to a whole new level! The upgrade brings improved workflows, better performance and many new features! 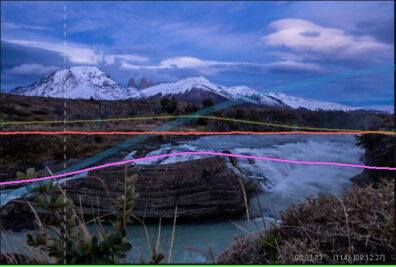 With the new visual previews you get “What you see is what you get” directly in LRTimelapse and the new Visual Deflicker is now one of the best – if not the best – deflicker tool available, because it works purely metadata-based on RAW files (even with multiple passes) and produces silky-smooth sequences. In combination with the “Holy Grail”-Wizard, even difficult Day-to-Night and Night-to-day transitions can be turned into smooth and visual appealing clips with ease. Video export is now possible in up to 8K resolution in the formats MP4, ProRes (Mac and Windows) or the new H.265. LRTimelapse 4 and the LRTExport Lightroom Plugin now fully support Lightroom 6 / Lightroom CC for faster Rendering including the new Lightroom Features like Filter Brush and 16 bit HDR DNGs. 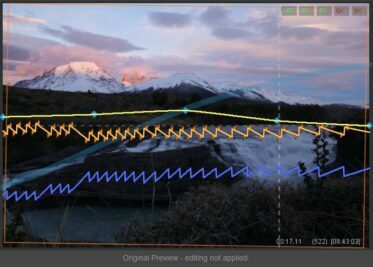 LRTimelapse 4 will be a game changer, that is for sure. Nearing the End of processing around 132000 frames plus some extra ones, and LRT4 has been of tremendous help. 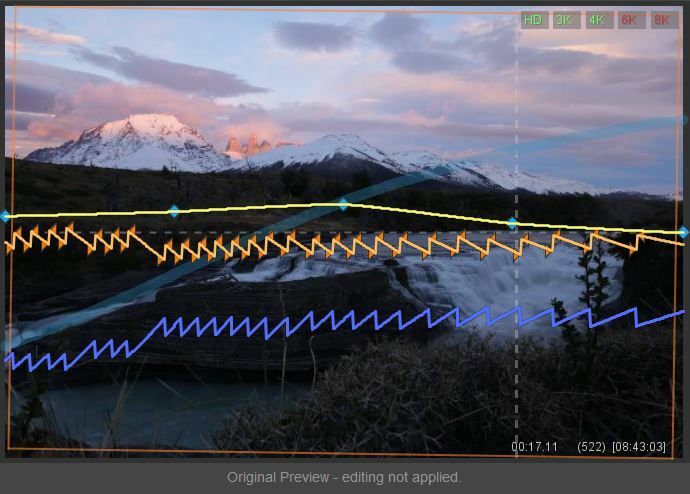 Speed, ease of use, workflow, output, everything brilliantly refined up to the most outstanding timelapse ramping, grading and processing software out there. This LRT4 makes wonders! I’m using it more than ever! I really enjoyed the new UI and all the improvements regarding the workflow, a must have tool! It’s such a great app. Would be lost without it. 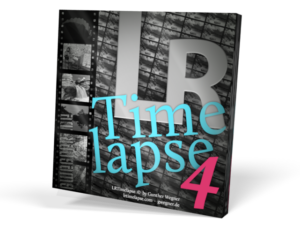 This is new in LRTimelapse 4! Visual Previews can now show the developed images instead of the flat previews. 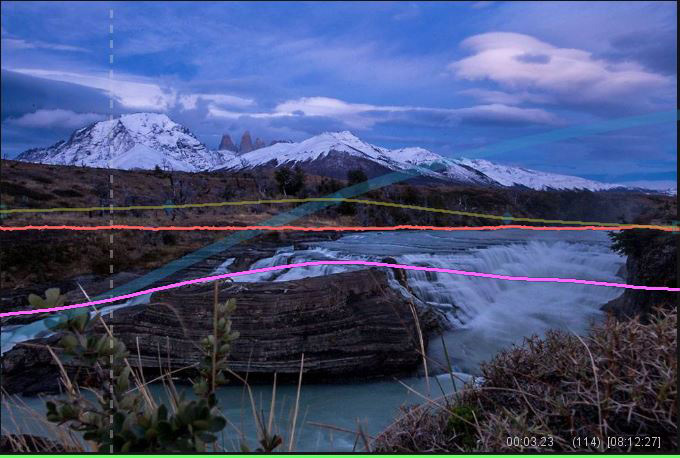 LRTimelapse then renders a nice luminance curve (pink) for the edited version and allows to use this as basis for a final deflickering. 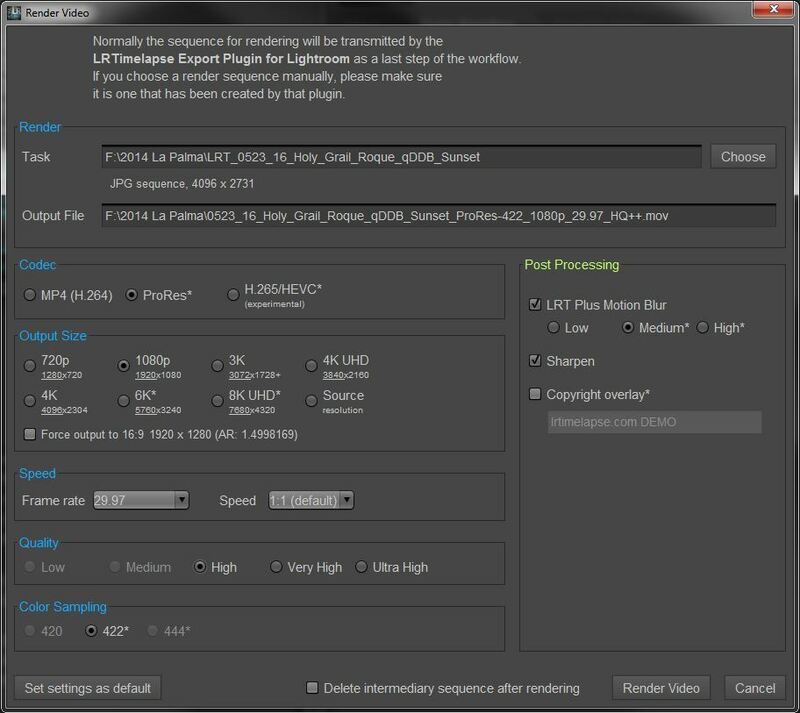 The visual previews allow LRTimelapse to calculate the deflicker after all editing have been applied. This is a major improvement, since it now deals with the fact, that Lightroom/ACR applies some tools in a non-linear way. This was something, where the old preview based deflicker sometimes hit it’s limits. 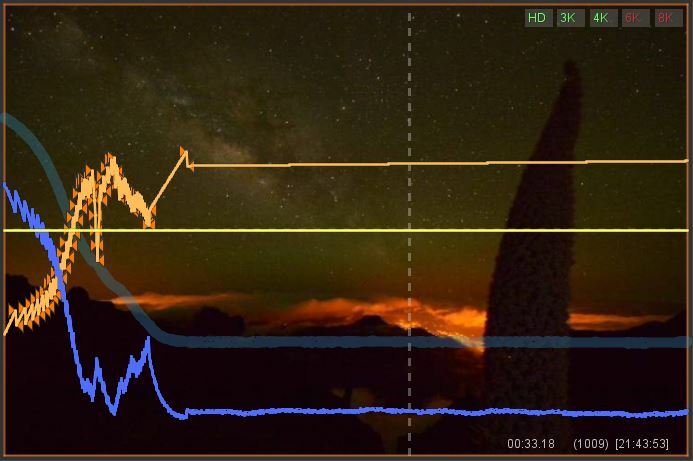 But now, since LRTimelapse 4 uses the developed preview as basis, we get great results that can even be gradually improved, by refining the deflicker in stepwise. Everything, including visual deflicker and refining will fully happen based on metadata-editing. This means, no quality loss will occur, regardless how often you refine the deflicker. Only when you export the video, the RAW files will get finally developed. Original Preview: the blue curve shows the original luminance progression. Exposure adjustments (yellow) are now independent from Holy Grail leveling (orange). Automatic corrections, like Auto Holy Grail compensations and Deflicker will now act in the background without affecting the Exposure tool in Lightroom/ACR. This means, that you now can even edit the Exposure manually on the keyframes of a Holy Grail sequence in Lightroom (maybe you remember, this was not possible in LRT3). Concluding, this allows you to edit holy grail sequences exactly the way you would edit regular, simple, time lapses. There is no difference anymore in the worfklow since all the luminance compensations will happen in the background. Furthermore even those corrections will get fine tuned after developing have been applied, by the new visual deflicker. Ramping went wrong here, so the blue luminance curve is way off at the beginning and there are some nasty peaks. Normally this would not be recoverable, or only with days of manual work. This is the visual preview after applying visual deflicker. The pink curve (visual luminance) is now totally smooth. The red curve shows the corrections that the deflicker applied. 4* (blue diamonds) will be used for all manual adjustments, regardless of the workflow. All old 1* keyframes will be automatically migrated. 5* (cyan squares) Keyframes will be used for animating the crop. 2*/3* (orange triangles) will be internally used for Holy Grail adjustments, but you normally won’t have to bother about them anymore at all . 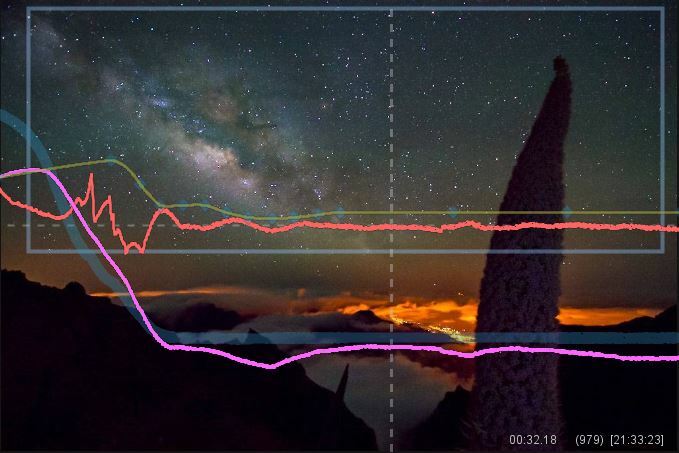 Lightroom 6 brings major performance improvements in comparison to the former version and is thus a very good choice for time lapse photographers. LRTimelapse 4 and the LRTExport Lightroom Plugin now fully support Lightroom 6. Even the new Filter Brush is supported. This filter brush is very convenient to remove brushed parts of the Gradient Adjustments, for example to keep a tree unfiltered, while the sky gets darker. The workflows have been revised and are even easier to use now. For most of your tasks, you will be able to use the new, universal, Visual Workflow. Initializing each sequence, usually the first thing to do in LRT3, will now happen automatically and in background – no need to worry about it anymore. The whole metadata handling is way more foolproof now, so that could even bring sequences in, that have been already edited outside LRTimelapse and preserve your former edits. 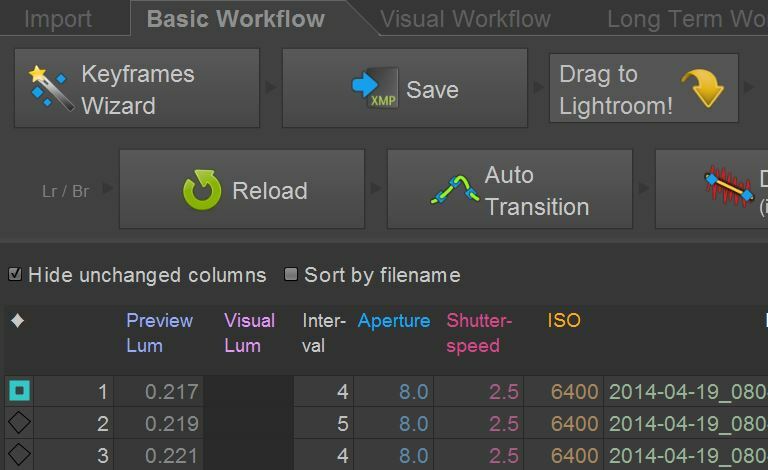 Basic Workflow – similar to LRTimelapse 3. The Basic Workflow is for simple, non-Holy Grail sequences. It offers the old, preview based deflicker. Mostly this will be used for JPG-sequences (for which the visual approach does not work. Maybe you can help me changing this by voting here. When loading a sequence detected as a holy grail sequence, LRT will automatically switch to the Visual Workflow. 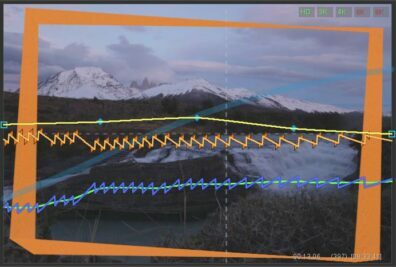 The new Visual Workflow – the right tool for nearly all scenarios. For any RAW sequence, holy Grail or not. This is mostly what you will be using if you shoot RAW (you should). Any Holy Grail sequence will automatically be detected by evaluating the exif-data. 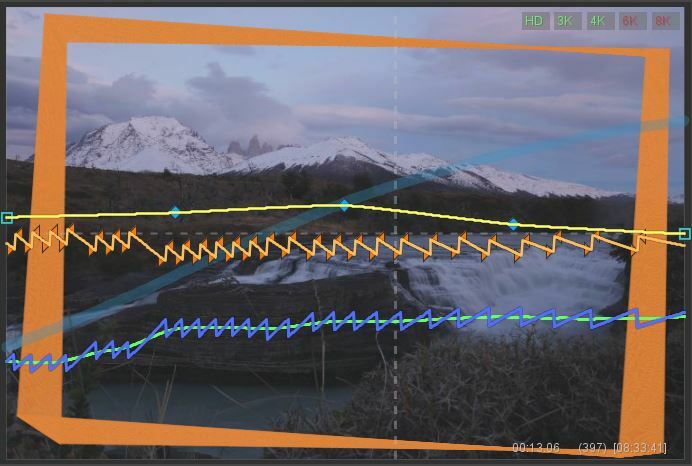 This workflow offers Holy Grail leveling, visual previews and visual deflicker. The Long-Term Workflow and Filters. Will help you sort though that huge long-term sequences. This new workflow is for you, if you shoot long term / construction time lapses with lots of changes in brightness, contrast and white balance. It provides sophisticated filters for Luminance, Contrast and Hue. This allows you to filter by all of these criteria to get rid of unwanted images in those long term time lapse sequences. This feature is something many of you were missing in LRT 3 so it’s here again! As a matter of fact, the Metadata-based Ken-Burns still has the limitation that Lightroom and ACR always crop to full pixels, but the Video-Encoder will handle the sequences fine now. Animating the crop works just by setting 5* keyframes and setting different crops on those. Transitions work much more transparent now. 4* keyframes will apply to all except crop, 5* to crop. If only 4* are present, crop will be animated from start to end if set differently. Huge – but still nice 🙂 User interface scaled by factor 2. Click to enlarge image. Scaling of the UI is now possible for screens with large resolutions. A default scaling will be set according to the screen resolution, but this can be overridden in the settings at any time. An Interval column is now being displayed in the table to visualise the shooting interval. This includes a graphical indicator for any variances. Seeing the interval makes it much easier to remove unwanted parts at the beginning or the end or split multiple sequences in parts. Previews and Snapshots are now created inside a hidden subfolder “.lrt” in the folder where the image sequence is located. When first loading a folder into LRT 4, any old previews will be automatically migrated to the new destination. This, for example, helps a lot when connecting external drives to different computers since the previews only have to be created once then. Previews and Snapshots will be easier to backup as well. There are a couple of advanced settings in LRTExport now as well, for example it’s possible to just re-export a part of the sequence, by selecting it and providing the initial sequence number. In such cases it might make sense to prevent LRTimelapse from instantly launching the rendering by selection “Skip LRTimelapse rendering”. Those to checkboxes might be used to render a sequence in 2 parallel tasks as well, though with Lightroom 6 it’s not necessary anymore and won’t give you advantages in terms of speed. Added 4K UHD and 8K UHD Settings. You now can render in 720p, 1080p, 3K, 4K UHD, 4K, 6K, 8K UHD and Original resolution (only supported by ProRes and H.265). Added 48, 50, 59.94 and 60 fps export settings, so now you have 23.97, 24, 25, 29.96, 30, 48, 50 and 59,94 fps available. Added experimental H265 encoding, however still not many video editing programs support it. If the intermediary sequence for rendering has gaps due to Lightroom Export errors or other issues with the naming, now a dialog will offer to fix this. This prevents the renderer from just stopping, as soon as it finds a wrong numbering due to missing frames or virtual copies in the sequence, but of course you might still experience jitter due to missing frames in the final output. Even, if you already know LRTimelapse 3, it’s importatn that you read my new instructions, to learn about the differences in workflow! When batch processes or an video render task is finished, now a sound is being played. You can turn this off in the settings. Shift-Save will force saving the whole table, even if nothing has changed. This might be used to make LRTimelapse write your new creator string into the XMP-files after you installed your license for example. 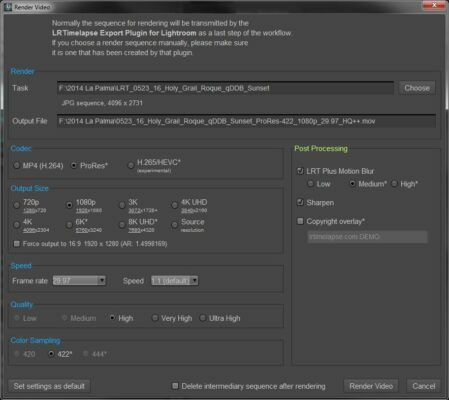 JPGs along to RAWs will now be ignored in LRTimelapse like it they are in Lightroom. They will be treaded as sidecars to the RAWs, this means they will get moved if the RAW is being moved and deleted, if the RAW is being deleted. When loading the blue luminance curve, now first 10 images spread over the sequence will get loaded, so that you can get a rough estimation of the luminance transitions of the whole sequence while the rest is loading. Full support for “flat” DNGs created from JPGs/TIFFs. Unfortunately currently DNG Converter cannot do this conversion, only Lightroom can. Please support my request to Adobe. Added +/- Buttons to some sliders to allow for exacter positioning. Single click will move in single steps, Ctrl in steps of 5, shift in steps of 10. Snapshots will now get the current date/time as default suggestion for their name. Image count in tree will now be loaded asynchronously, speeding up handling with long directories. When loading an intermediary sequence into LRTimelapse (normally not necessary anymore because of the visual workflow), any 2*/3* keyframes that Lightroom might have exported will be ignored. Added Auto-Transition for column to right click table header menu. Added check for DNGConverter and LRTimelapse Addons on startup. Updated “Create Keyframes (evenly spaced) dialog, it will now bring up a slider as well to create the keyframes. Improved folder rename and “New folder from selection” dialogs. Improved folder and file moving. Folder moving will now work for folders with subfolders as well. Please note, that not all features are available with the free or personal license. Check out the feature-matrix to learn about the differences. Interested in buying a license or upgrading? This is what you need! If you don’t have any previous LRTimelapse License, you can test the free version and then you can decide between the LRTimelapse 4 Private or LRTimelapse 4 Pro license. You’ll find the differences in this feature matrix. 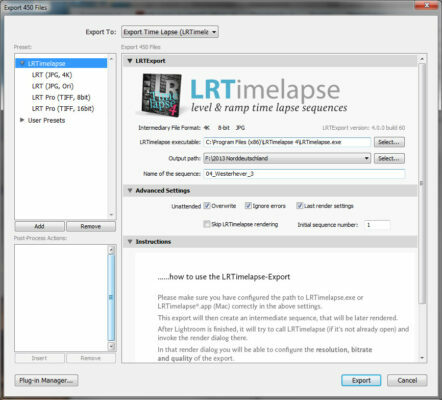 a) A discounted Upgrade to LRTimelapse 4. With the upgrade you will stay with the same license class (Private/Pro) that you have been before. b) Should you consider to crossgrade from a Private license to Pro in the near future, this might be the right time! By crossgrading now, you can convert your older Private license directly into a LRT4 Pro license. That way you’ll save the upgrade fee!